> Yesterday, the NL MVP was handed out. This marked the last major award of the offseason. And I’m proud to say that, for the first time ever, I got all of my predictions right. Not that I agreed with all of them, but they were probably the most logical choice fore each award. > Most of them seemed deserving enough. Although I was surprised to see Longoria even on the AL MVP ballot. > Anyway, onto some Brewers news. They’ve offered arbitration to free agents Prince Fielder and Francisco Rodriguez. Assuming both decline it (which they probably both will), the Brewers will get four premium picks in next year’s First-Year Player Draft. > Which brings me to my next point. I didn’t pay much attention to the small print of the labor agreement reached between MLB and the players’ union because I was celebrating Braun’s MVP award, but apparently this new agreement is creating a salary cap on how much teams can pay players to sign with them after being drafted. This will probably effect how some teams draft for the next five years, especially teams that rely on the draft in order to contend, such as the Rays. But hey, it’s what we’ve grown to expect from Bud Selig. > The biggest news of today was the Indians bringing back the injury-prone Grady Sizemore on a one-year deal worth around $5 million. I guess they aren’t giving up on the center fielder yet, despite the fact he’s had five different surgeries over the past three years, and has averaged below 100 games played per season during that span. > Thanks for reading, and feel free to leave your thoughts. I’ll update again if any other big news comes out tonight. The Brewers don’t have good defense. That’s why nobody on the Brewers received any of the Gold Glove Awards that were handed out yesterday. But you can’t argue with the fact that- despite its inconsistency- the Brewers have a rather destructive offense. So, it was fitting that a few Brewers took home the offense-related awards that were handed out today. Ryan Braun and Prince Fielder both won the 2011 Silver Slugger Award at their respective positions: outfield and first base. It’s the second straight season that they had multiple winners, as Braun also won last year, along with pitcher Yovani Gallardo. Braun had a career year in multiple categories. He hit 33 home runs with 111 RBIs, and also had a .332 batting average- a new career best for him, and second in the NL in 2011. Braun also led the NL in OPS at .994, and led in slugging percentage at .597. Not to mention this is Braun’s fourth year in a row winning the Silver Slugger Award. This was Fielder’s second Silver Slugger Award, as he also won in 2007. Fielder winning it this year broke Albert Pujols’ three-year streak of winning the award at first base. Anyway, Fielder hit 38 home runs with a 120 RBIs. He also hit .299, which tied a career-high. I think most of these guys were deserving of winning it. Cubs manager Mike Quade finally got fired. Newly appointed president of the Cubs, Theo Epstein, flew to Florida to tell Quade personally that he wouldn’t be returning to the Cubs in 2012. In Quade’s only full season with the Cubs, he went 71-91, which obviously wasn’t going to cut it. Oh, and one more thing related to the Cubs and Epstein- the Cubs and Red Sox still haven’t agreed on compensation for Epstein leaving the Sox with time still left on his contract. At first, the Sox wanted Matt Garza from the Cubs, which was just plain stupid. But now I guess they can’t even agree on a Minor Leaguer. Frank McCourt agreed to sell the Dodgers today. Apparently, the team is going to be auctioned off. But it’s about time. I’m not big into the Dodgers, but those fans- and the players themselves- have had to suffer enough under that dink McCourt. A baseball team shouldn’t have to suffer because of the owner’s personal issues (if you didn’t know already, this all started when McCourt and his wife- who was the president of the Dodgers- got divorced). Anyway, a few other moves- the Nationals are close to re-signing starter Chien-Ming Wang, who has missed the better of the last two years with injuries. Also, John McDonald, a great defensive shortstop, re-signed for two years with Diamondbacks. Isn’t this a surprise. 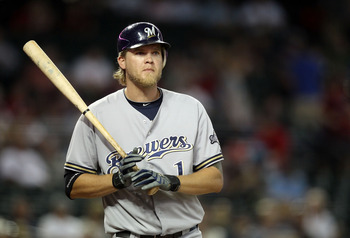 The 2011 Gold Glove Awards were handed out today, and nobody on the Brewers won. Normally, I’d try to defend the Brewers and at least attempt to make a case that someone on the team should win (which I’ll actually do for three players later in this article). But, other than those three players, I can’t make a case for any infielder on the Brewers. If I remember my stats correctly, third baseman Casey McGehee, shortstop Yuniesky Betancourt, and first baseman Prince Fielder all led the league in errors at their respective positions. I don’t think second baseman Rickie Weeks led the league in errors at second base, but I’m pretty sure he was up there. Not to mention the outfield. Corey Hart has a cannon arm (although it isn’t always accurate), but, other than that, he looks like a fool in right field. Platoon center fielders Carlos Gomez and Nyjer Morgan each had their share of highlight reel plays, but also made costly misplays. Then there was that awful inning in the Brewers’ last game of the postseason- game 6 of the NLCS- where the Brewers made about five errors in two plays (but were only charged for three; the error is such a pathetic stat). That pretty much closed the book for me on the Brewers’ 2011 defense, and hopefully that’s Doug Melvin’s top priority this offseason. I didn’t get to see all many of these guys play very often this year to judge how good their defense actually was, but really- Gerardo Parra over Ryan Braun? And Kershaw is pretty much a lock for the NL Cy Young Award, does he really need a Gold Glove too? From the Brewers, I think Zack Greinke and Shaun Marcum at least deserved consideration for the Gold Glove Award at pitcher. Marcum was on the highlight reel all the time, while Greinke was just a good defender. But again, I can’t judge how good Kershaw’s defense really is, because I don’t watch “Dodgers Baseball!” (as Vin Scully would say) very often. But I never saw him on a highlight reel. The Cardinals picked up and declined some options today. They picked up Molina’s option, which was expected, but they declined shortstop Rafael Furcal’s and Octavio Dotel’s options- something I didn’t expect. Maybe they intend to bring back Furcal for less money- either that, or they’re stuck with Ryan Theriot at short again, and we all know how that turned out. And Dotel was a great right-handed reliever, but he’s aging, which is probably why the Cards declined his option. Brian Cashman is going back to what he’s done best over the past few years for the Yankees- spend as much money as possible and taunt the best players in the game to come to the Yanks. I’ve never really said this on this blog before, but I’m not a huge Cashman fan. Anyway, he’s back on three-year deal for them. Lastly, the Cubs formally introduced Jed Hoyer as their new GM, and Jason McLeod as the head of scouting and player development. The only reason these guys are there is because of the Cubs’ new president- Theo Epstein. Together, these three created a World Series team in 2004 for the Red Sox. It’s been awhile. Sorry for not getting up an articles in a couple days; I’m having a pretty stressful week. I’ve had close to no time to even get on the computer, much less write a full article. But I’m back, and should have all the postseason coverage on this blog. Speaking of the postseason. The last time I posted was when the Brewers clinched the NL Central on Ryan Braun’s clutch home run against the Marlins. From there, the Brewers went on to sweep the Marlins and win their regular season-ending series against the Pirates. The also finished with a franchise record 96 wins, which is astounding, if you think about it. But wow, did some crazy things happen in both Wild Card races yesterday. The Rays and Cardinals are headed to the postseason. If I told you that coming into September, you would have called me crazy. I would have called myself crazy. But it happened, thanks to historical September meltdowns by the Braves and Red Sox. That’s right. The Red Sox. The dream fantasy team, that had Adrian Gonzalez, Jacoby Ellsbury, Carl Crawford, David Ortiz, Dustin Pedroia, Josh Beckett, Jon Lester- I could go on forever. And they blew a nine-game Wild Card lead. That’s the largest Wild Card lead blown since it was introduced in the early 90’s. Anyway, here’s what happened to them last night. After a rain delay that lasted a few hours in Baltimore, the Red Sox led the Orioles, 3-2, in the ninth inning. Jonathan Papelbon, one of the best closers in the game, was in to try and finish it off. And he blew it. He gave up two runs, the parting blow coming from Robert Andino- a name that no casual baseball fan has ever heard. But, he’ll always be remembered as part of what ruined what could have been a good season for the BoSox. But something great had to happen in St. Pete if the Rays were to make the postseason, right? And it was great. They were playing the Yankees, and were down 7-0 going into the eighth inning. But, they scored six runs in the eighth, putting a ton of pressure on the Yankees to close it out in the ninth. The Yankees must not have felt that much pressure, though- they didn’t even put in all-time saves leader Mariano Rivera (ugh, it feels weird saying that) to close out a one-run game. That resulted in a game-tying home run by Dan Johnson (another name that a casual baseball fan has never heard). But, the Rays wouldn’t clinch their postseason berth until the 12th inning. It came on a line-drive home run by Longoria- his second of the game- and it left the Red Sox absolutely stunned. Even I’m still trying to get a grip on the fact that the Red Sox aren’t going to be in the postseason. Anyway, the Cardinals can thank two players in particular for getting them into the postseason- Chris Carpenter and Craig Kimbrel. Carpenter tossed a two-hitter against the Astros, and Kimbrel, unable to contain his emotions in the ninth inning, blew a crucial save against the Phillies, ending the Braves’ season abruptly. But, with all that out of the way, let’s get down to business. The regular season is over; now, we wait and see who’ll reach the Fall Classic. Thanks to the Cardinals reaching the postseason, the Brewers will host the Diamondbacks in the NLDS. To be honest with you, this completely messes up my predictions for the postseason- I was hoping for a Brewers-D-Backs NLCS. But that obviously can’t happen now. You can just tell by looking at the numbers that these are all going to be great match-ups. But, it couldn’t have come out better for the Brewers- and you’re about to figure out why home field advantage was so important to the Crew. Gallardo and Greinke each have 11 wins at home this year. Gallardo has two losses, and Greinke has none. This is why home field advantage was so important. Both pitchers are practically invincible at home, especially Greinke, who is invincible at home (at least so far). Kennedy and Hudson obviously won’t be easy to beat, however, so expect a few pitchers’ duels. Oh, by the way, I just thought I should mention this- Gallardo is 5-0 with a 1.20 ERA in his career against the D-Backs. That could be a pretty big factor. Then, the series changes venues- which also plots out in the Brewers’ favor. Marcum has been that one guy who is different from everyone in the rotation. Instead of being great at home, he’s great on the road- his 2.31 ERA on the road proves that. Anyway, that’s all I’ve got for now. The two ALDS’s start tomorrow between the Rays and Rangers, and Yankees and Tigers, so we’ll have those to keep us company until the NLDS starts. The Yanks-Tigers game will be interesting- CC Sabathia, a former Brewer, will face Justin Verlander, who has a no-hitter against the Brewers. That’s a game I won’t be missing. Anyway, one more thing before I go- let me say that this could be a magical year for the Brewers. And that’s everybody. Remember that some of these guys got injured and won’t be playing, but their replacements are listed as well. And some of the pitchers who threw yesterday (Sunday) aren’t allowed to pitch in the All-Star Game, due to that stupid new rule. A few examples of guys who can’t pitch because of that rule are Hernandez, Hamels, Cain, Sabathia, Shields, etc. Braun would be starting in the outfield for the National League, had it not been for that stupid calf injury. At least we’ve got Weeks and Fielder in the starting lineup, though. Weaver and Halladay should be a good matchup. To be honest, I would have rather seen Jurrjens starting instead of Halladay so it would have been the two ERA leaders facing off. But that was Bruce Bochy’s decision, not mine. Anyway, the Home Run Derby is starting in an hour, so I’m pretty excited for that. I’ll have some coverage up after the derby ends. As far as the AL goes, it’s the typical starting lineup for them, meaning the Yankees and Red Sox took most of the positions. Every starter for them is a player of the AL East, save for Avila and Hamilton.